For the former Chekiang province of the Republic of China, see Chekiang Province, Republic of China. For the river historically known Zhejiang, see Qiantang River. Not to be confused with Jiangzhe. 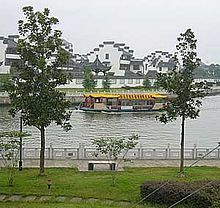 Zhejiang ( 浙江; formerly romanized as Chekiang) is an eastern coastal province of China. Zhejiang is bordered by Jiangsu and Shanghai to the north, Anhui to the northwest, Jiangxi to the west, and Fujian to the south. To the east is the East China Sea, beyond which lie the Ryukyu Islands of Japan. The province's name derives from the Zhe River (浙江, Zhè Jiāng), the former name of the Qiantang River which flows past Hangzhou and whose mouth forms Hangzhou Bay. It is usually understood as meaning "Crooked" or "Bent River", from the meaning of Chinese 折, but is more likely a phono-semantic compound formed from adding 氵 (the "water" radical used for river names) to phonetic 折 (pinyin zhé but reconstructed Old Chinese *tet), preserving a proto-Wu name of the local Yue, similar to Yuhang, Kuaiji, and Jiang. Kuahuqiao culture was an early Neolithic culture that flourished in the Hangzhou area in 6,000-5,000 BC. Zhejiang was the site of the Neolithic cultures of the Hemudu (starting in 5500 BC) and Liangzhu (starting in 3400 BC). The area of modern Zhejiang was outside the major sphere of influence of Shang civilization during the second millennium BC. Instead, this area was populated by peoples collectively known as Dongyue and the Ouyue. The kingdom of Yue began to appear in the chronicles and records written during the Spring and Autumn period. According to the chronicles, the kingdom of Yue was in northern Zhejiang. Shiji claims that its leaders were descended from the Shang founder Yu the Great. The "Song of the Yue Boatman" (Chinese: 越人歌; pinyin: Yuèrén Gē; literally: 'Song of the man of Yue') was transliterated into Chinese and recorded by authors in north China or inland China of Hebei and Henan around 528 BC. The song shows that the Yue people spoke a language that was mutually unintelligible with the dialects spoken in north and inland China. The Sword of Goujian bears bird-worm seal script. Yuenü (Chinese: 越女; pinyin: Yuènǚ; Wade–Giles: Yüeh-nü; literally: 'the Lady of Yue') was a swordswoman from the state of Yue. To check the growth of the kingdom of Wu, Chu pursued a policy of strengthening Yue. Under King Goujian, Yue recovered from its early reverses and fully annexed the lands of its rival in 473 BC. 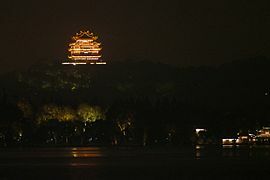 The Yue kings then moved their capital center from their original home around Mount Kuaiji in present-day Shaoxing to the former Wu capital at present-day Suzhou. With no southern power to turn against Yue, Chu opposed it directly and, in 333 BC, succeeded in destroying it. Yue's former lands were annexed by the Qin Empire in 222 BC and organized into a commandery named for Kuaiji in Zhejiang but initially headquartered in Wu in Jiangsu. At the beginning of the Three Kingdoms era (220–280 CE), Zhejiang was home to the warlords Yan Baihu and Wang Lang prior to their defeat by Sun Ce and Sun Quan, who eventually established the Kingdom of Wu. Despite the removal of their court from Kuaiji to Jianye (present-day Nanjing), and they continued development of the region and benefitted from influxes of refugees fleeing the turmoil in northern China. Industrial kilns were established and trade reached as far as Manchuria and Funan (South Vietnam). Despite the continuing prominence of Nanjing (then known as Jiankang), the settlement of Qiantang, the former name of Hangzhou, remained one of the three major metropolitan centers in the south to provide major tax revenue to the imperial centers in the north China. The other two centers in the south were Jiankang and Chengdu. In 589, Qiantang was raised in status and renamed Hangzhou. Following the fall of Wu and the turmoil of the Wu Hu uprising against the Jin dynasty (265–420), most of elite Chinese families had collaborated with the non-Chinese rulers and military conquerors in the north. Some may have lost social privilege, and took refugee in areas south to Yangtze River. Some of the Chinese refugees from north China might have resided in areas near Hangzhou. 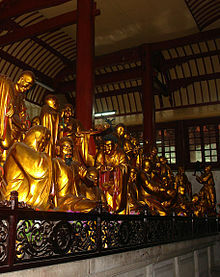 For example, the clan of Zhuge Liang (181–234), a chancellor of the state of Shu Han from Central Plain in north China during the Three Kingdoms period, gathered together at the suburb of Hangzhou, forming an exclusive, closed village Zhuge Village (Zhege Cun), consisting of villagers all with family name "Zhuge". The village has intentionally isolated itself from the surrounding communities for centuries to this day, and only recently came to be known in public. It suggests that a small number of powerful, elite Chinese refugees from the Central Plain might have taken refugee in south of the Yangtze River. However, considering the mountainous geography and relative lack of agrarian lands in Zhejiang, most of these refugees might have resided in some areas in south China beyond Zhejiang, where fertile agrarian lands and metropolitan resources were available, mainly southern Jiangsu, eastern Fujian, Jiangxi, Hunan, Anhui, and provinces where less cohesive, organized regional governments had been in place. Metropolitan areas of Sichuan was another hub for refugees, given that the state of Shu had long been founded and ruled by political and military elites from the Central Plain and north China. Some refugees from the north China might have found residence in south China depending on their social status and military power in the north. The rump Jin state or the Southern dynasties vied against some elite Chinese from the Central Plain and south of the Yangtze River. After the collapse of the Tang dynasty in 907, the entire area of what is now Zhejiang fell under the control of the kingdom Wuyue established by King Qian Liu, who selected Hangzhou (a city in the modern day area of Zhejiang) as his kingdom's capital. Despite being under Wuyue rule for a relatively short period of time, Zhejiang underwent a long period of financial and cultural prosperity which continued even after the kingdom fell. After Wuyue was conquered during the reunification of China, many shrines were erected across the former territories of Wuyue, mainly in Zhejiang, where the kings of Wuyue were memorialised, and sometimes, worshipped as being able to dictate weather and agriculture. 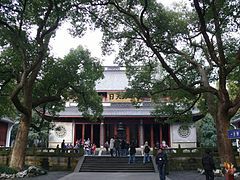 Many of these shrines, known as "Shrine of the Qian King" or "Temple to the Qian King", still remain today, with the most popularly visited example being that near West Lake in Hangzhou. China's province of Zhejiang during the 940s was also the place of origin of the Hú family (Hồ in Vietnamese) from which the founder of the Hồ Dynasty who ruled Vietnam, Emperor Hồ Quý Ly, came from. The Song dynasty re-established unity around 960. Under the Song, the prosperity of South China began to overtake that of North China. After the north was lost to the Jurchen Jin dynasty in 1127 following the Jingkang Incident, Hangzhou became the capital of the Song dynasty under the name Lin'an, which was renowned for its prosperity and beauty, it was suspected to have been the largest city in the world at the time. From then on, northern Zhejiang and neighboring southern Jiangsu have been synonymous with luxury and opulence in Chinese culture. The Mongol conquest and the establishment of the Yuan dynasty in 1279 ended Hangzhou's political clout, but its economy continued to prosper. The famous traveler Marco Polo visited the city, which he called "Kinsay" (after the Chinese Jingshi, meaning "Capital City") claiming it was "the finest and noblest city in the world". Greenware ceramics made from celadon had been made in the area since the 3rd-century Jin dynasty, but it returned to prominence—particularly in Longquan—during the Southern Song and Yuan. Longquan greenware is characterized by a thick unctuous glaze of a particular bluish-green tint over an otherwise undecorated light-grey porcellaneous body that is delicately potted. Yuan Longquan celadons feature a thinner, greener glaze on larger vessels with decoration and shapes derived from Middle Eastern ceramic and metalwares. These were produced in large quantities for the Chinese export trade to Southeast Asia, the Middle East, and (during the Ming) Europe. By the Ming, however, production was notably deficient in quality. It is in this period that the Longquan kilns declined, to be eventually replaced in popularity and ceramic production by the kilns of Jingdezhen in Jiangxi. Zhejiang was finally conquered by the Mongols in the late 13th century who later established the short lived Yuan dynasty. The Ming dynasty, which drove out the Mongols in 1368, finally established the present day province of Zhejiang with its borders having little changes since this establishment. As in other coastal provinces, number of fortresses were constructed along the Zhejiang coast during the early Ming to defend the land against pirate incursions. Some of them have been preserved or restored, such as Pucheng in the south of the province (Cangnan County). During the First Opium War, the British navy defeated Eight Banners forces at Ningbo and Dinghai. Under the terms of the Treaty of Nanking, signed in 1843, Ningbo became one of the five Chinese treaty ports opened to virtually unrestricted foreign trade. Much of Zhejiang came under the control of the Taiping Heavenly Kingdom during the Taiping Rebellion, which resulted in a considerable loss of life in the north-western and central parts of the province, sparing the rest of Zhejiang from the disastrous depopulation that occurred. In 1876, Wenzhou became Zhejiang's second treaty port. Jianghuai Mandarin speakers later came to settle in these depopulated regions of northern Zhejiang. 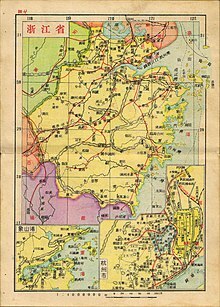 During the Second Sino-Japanese War, which led into World War II, much of Zhejiang was occupied by Japan and placed under the control of the Japanese puppet state known as the Reorganized National Government of China. Following the Doolittle Raid, most of the B-25 American crews that came down in China eventually made it to safety with the help of Chinese civilians and soldiers. The Chinese people who helped them, however, paid dearly for sheltering the Americans. The Imperial Japanese Army began the Zhejiang-Jiangxi Campaign to intimidate the Chinese out of helping downed American airmen. The Japanese killed an estimated 250,000 civilians from the area of Hangzhou to Nanchang and also Zhuzhou while searching for Doolittle's men. After the People's Republic of China took control of Mainland China in 1949, the Republic of China government based in Taiwan continued to control the Dachen Islands off the coast of Zhejiang until 1955, even establishing a rival Zhejiang provincial government there, creating a situation similar to Fujian province today. During the Cultural Revolution (1966–76), Zhejiang was in chaos and disunity, and its economy was stagnant, especially during the high tide (1966–69) of the revolution. The agricultural policy favoring grain production at the expense of industrial and cash crops intensified economic hardships in the province. Mao's self-reliance policy and the reduction in maritime trade cut off the lifelines of the port cities of Ningbo and Wenzhou. While Mao invested heavily in railroads in interior China, no major railroads were built in South Zhejiang, where transportation remained poor. The eleven prefecture-level divisions of Zhejiang are subdivided into 90 county-level divisions (36 districts, 20 county-level cities, 33 counties, and one autonomous county). Those are in turn divided into 1,570 township-level divisions (761 towns, 505 townships, 14 ethnic townships, and 290 subdistricts). Hengdian belongs to Jinhua, which is the largest base of shooting films and TV dramas in China. Hengdian is called "China's Hollywood". At the year end of 2017, the total population is 56.57 million. ^ a b New districts established after census: Fuyang (Fuyang CLC), Lin'an (Lin'an CLC). These new districts not included in the urban area & district area count of the pre-expanded city. ^ a b New district established after census: Dongtou (Dongtou County). The new district not included in the urban area & district area count of the pre-expanded city. ^ a b New district established after census: Fenghua (Fenghua CLC). The new district not included in the urban area & district area count of the pre-expanded city. ^ a b New districts established after census: Keqiao (Shaoxing County), Shangyu (Shangyu CLC). These new districts not included in the urban area & district area count of the pre-expanded city. 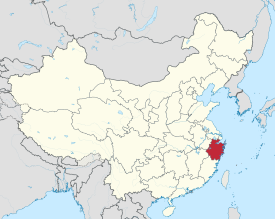 ^ Yuhuan County is currently known as Yuhuan CLC after census. Zhejiang is one of the richest and most developed provinces in China. As of 2018, its nominal GDP was US$849 billion (CN￥ 5.62 trilion), about 6.24% of the country's GDP and ranked 4th among province-level administrative units; the province's primary, secondary, and tertiary industries were worth CN￥196.70 billion (US$29.72 billion), CN￥2.3506 trillion (US$355.22 billion), and CN￥3.0724 trillion (US$464.29 billion) respectively. Its nominal GDP per capita was US$14,907 (CN￥98,643) and ranked the 5th in the country. The private sector in the province has been playing an increasingly important role in boosting the regional economy since Economic Reform in 1978. Zhejiang's main manufacturing sectors are electromechanical industries, textiles, chemical industries, food, and construction materials. In recent years Zhejiang has followed its own development model, dubbed the "Zhejiang model", which is based on prioritizing and encouraging entrepreneurship, an emphasis on small businesses responsive to the whims of the market, large public investments into infrastructure, and the production of low-cost goods in bulk for both domestic consumption and export. As a result, Zhejiang has made itself one of the richest provinces, and the "Zhejiang spirit" has become something of a legend within China. However, some economists now worry that this model is not sustainable, in that it is inefficient and places unreasonable demands on raw materials and public utilities, and also a dead end, in that the myriad small businesses in Zhejiang producing cheap goods in bulk are unable to move to more sophisticated or technologically more advanced industries. The economic heart of Zhejiang is moving from North Zhejiang, centered on Hangzhou, southeastward to the region centered on Wenzhou and Taizhou. The per capita disposable income of urbanites in Zhejiang reached 55,574 yuan (US$8,398) in 2018, an annual real growth of 8.4%. The per capita disposable income of rural residents stood at 27,302 yuan (US$4,126), a real growth of 9.4% . Traditionally, the province is known as the "Land of Fish and Rice". True to its name, rice is the main crop, followed by wheat; north Zhejiang is also a center of aquaculture in China, and the Zhoushan fishery is the largest fishery in the country. The main cash crops include jute and cotton, and the province also leads the provinces of China in tea production. (The renowned Longjing tea is a product of Hangzhou.) Zhejiang's towns have been known for handicraft production of goods such as silk, for which it is ranked second among the provinces. Its many market towns connect the cities with the countryside. 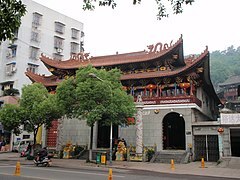 In mid-2015 the government of Zhejiang recognised folk religion as "civil religion" beginning the formal registration of the province's folk religious temples under the aegis of the provincial Bureau of Folk Faith. Buddhism has an important presence since its arrival in Zhejiang 1,800 years ago. 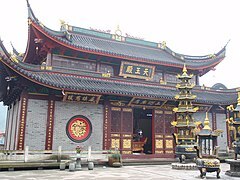 Temple of All-Heaven (都天廟Dōutiānmiào) in Longgang, Cangnan, Wenzhou. Zhejiang is the home of Yue opera, one of the most prominent forms of Chinese opera. Yueju originated in Shengzhou and is traditionally performed by actresses only, in both male and female roles. Other important opera traditions include Yongju (of Ningbo), Shao opera (of Shaoxing), Ouju (of Wenzhou), Wuju (of Jinhua), Taizhou Luantan (of Taizhou) and Zhuji Luantan (of Zhuji). ^ May also include a tiny number of Muslims. ^ 2013年浙江省国民经济和社会发展统计公报 (in Chinese). Zhejiang Provincial Statistic Bureau. 26 February 2014. Retrieved 5 March 2014. ^ "China National Human Development Report 2016" (PDF). United Nations Development Programme. p. 146. Retrieved 5 December 2017. ^ People's Daily Online. "Origin of the Names of China's Provinces". (in Chinese). ^ Baxter, William & al. "Baxter-Sagart Old Chinese Reconstruction". Accessed 20 May 2012. ^ Hays, Jeffrey. "HEMUDU, LIANGZHU AND MAJIABANG: CHINA'S LOWER YANGTZE NEOLITHIC CULTURES | Facts and Details". factsanddetails.com. Retrieved 28 November 2018. ^ "Largest Cities Through History". Geography.about.com. 19 July 2013. Retrieved 10 September 2013. ^ "PBS Perilous Flight". Pbs.org. Retrieved 10 September 2013. ^ "China Economy @ China Perspective". Thechinaperspective.com. 6 September 2013. Retrieved 10 September 2013. ^ "Country Profile: Zhejiang Province". 11 February 2007 – via en.people.cn. ^ "China council for the promotion of international trade (ccpit)ZheJiang sub-council". Ccpitzj.gov.cn. Retrieved 10 September 2013. ^ “正名”后的民间信仰 浙江新制度共创社会文化效益. Xinhua, 2017/01/03. Retrieved 2017/04/27. Archived. ^ Chen Jinguo, Lin Minxia. 如何走向“善治”：浙江省民間信仰“社會治理”轉型的反思 (How to Go Towards "Good Governance": Reflection on Folk Beliefs' "Social Governance" Transformation in Zhejiang). Qiu Yonghui (ed.). Chinese Religion Report - Religion Blue Book - 2015 Edition. Social Science Literature Publishing House, 2016. Gooread 2017/01/04. Archived. ^ a b c 浙江省宗教概况], 浙江省民族宗教事务委员会. Ethnic and Religious Affairs Committee of Zhejiang. ^ Statistics for the Protestant Church: China, Chinese Theological Review, 14, p. 154. 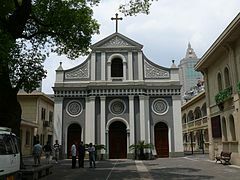 ^ Congressional-Executive Commission on China: Zhejiang Government Launches Demolition Campaign, Targets Christian Churches. ^ Govt efforts key to desensitizing religious management, Global Times.